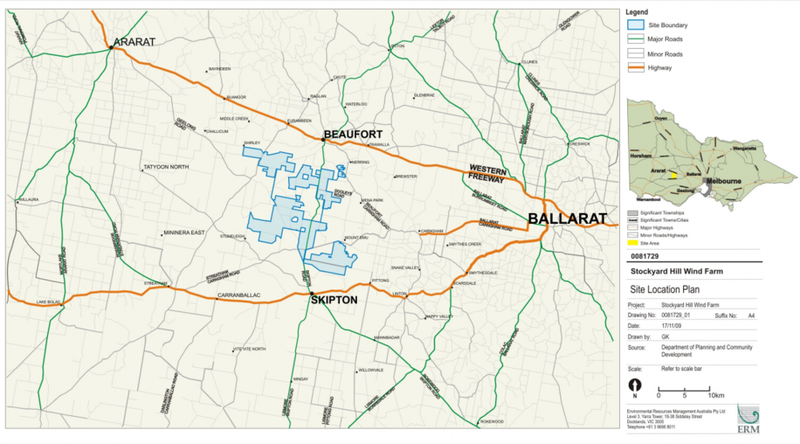 The Stockyard Hill Wind Farm (SHWF) is a proposed wind energy project located approximately 35 km west of Ballarat in Victoria's central highlands. The project boundary extends to five kilometres south of Beaufort and approximately four kilometres north of Skipton. In October 2010, the Victorian Minister for Planning granted approval for 157 turbines at the Stockyard Hill Wind Farm and all of the associated planning permits. The granting of the Planning Permits was a major step forward for the Stockyard Hill Wind Farm project. Further design work has been undertaken since then as part of the detailed work requirement of the approvals and conditions. As part of this process, SHWF consulted with wind turbine manufacturers, extensive modelling suggests that utilising the latest wind turbine technology and increasing the tip height from the already permitted 132 metres to a maximum 180 metres substantially improves the efficiency of the project. As such, SHWF lodged an application to amend the current Permit to increase the maximum height of the turbines from the permitted 132 metres to up to 180 meters. The changes would result in an increased 'swept area' for each tower, which would help drive down the cost of energy generated from this project and may produce more clean energy from the same number of wind towers. In June 2017, The Victorian Government has approved the Planning Amendment that primarily increases the tip height to 180 metres. The Victorian Government also approved an on-site quarry and native vegetation removal associated with the overhead 132 kV powerlines required to connect the wind farm to the 500 kV network south of Lismore. Please find a link below to Panels report and associated permits. The project is expected to deliver significant economic benefits including the creation of ongoing jobs, rates to the local government, rent to participating landowners and a community fund. The proposed wind farm will connect to the national electricity grid via the transmission line and terminal station south of Lismore. SHWF have commenced a tender process to engage contractors to construct the wind farm. Stockyard Hill Wind Farm intends to commence construction in early 2018, and exporting energy by late 2019.